Incredibly versatile, mix PhD Diet Whey Powder with yoghurt to make a delicious dessert, or combine with porridge oats or pancake mix for a tasty & filling breakfast. Blend 25g PhD Diet Whey Powder Chocolate Orange with 175ml cold water. Use 2-3 servings daily to help support adequate protein intake. Take any time of the day pre- or post-workout. For Women: Add 1 or 2 scoops (depending upon preference and requirements) of Diet Whey to 175ml (if 1 scoop used) or 350ml (if 2 scoops used) of ice cold water and shake for 10 seconds. Diet Whey provides a smooth, full-bodied shake to enhance satiety throughout the day and help to stop sugar cravings to meet physique and performance goals. PhD Lean Body Slow Release Protein Blend (Whey Protein Concentrate (Milk) (27%), Milk Protein Concentrate, Soy Protein Isolate), Enduragrain(TM) Long Chain Waxy Barley Starch, Golden Brown Flaxseed Powder, Dietary Fibres (Acacia Gum, Guar Gum, Xanthan Gum), Flavouring, CLA Powder (contains milk protein, Lecithin, Vitamin E anti-oxidants), Citric Acid, Acetyl L-Carnitine, Natural Colour:- Beetroot Red, Green Tea Extract, Sodium Chloride, Sweetener:- Sucralose. 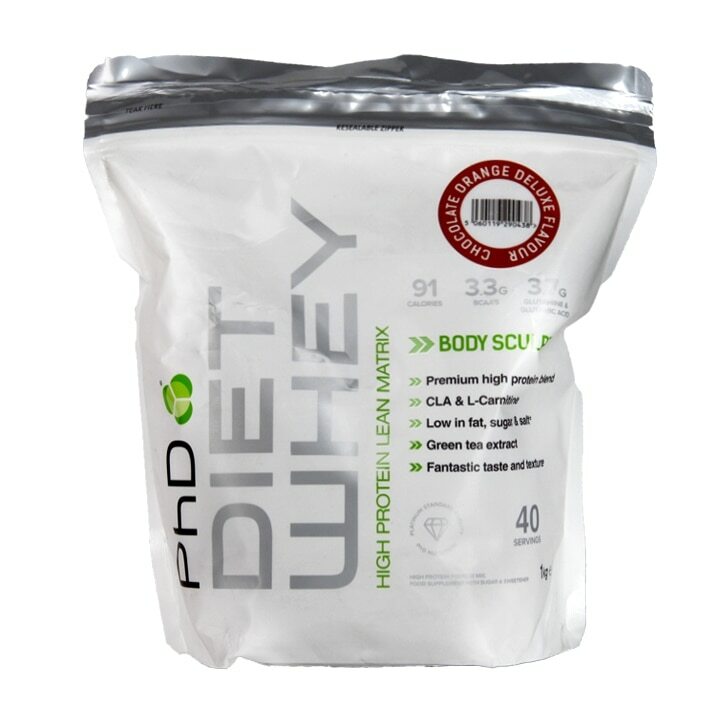 PhD Diet Whey Powder Chocolate Orange is rated 4.7 out of 5 by 41.